Summary: David Rocco’s Italian adventures continue with Made n Italy, a sumptuous collection of over 140 recipes for mouth-watering pastas, pizzas, soups, drinks and much more. Rustic, simple dishes, such as Caponata Napoletana, Spaghetti alla Carbonara and Bistecca Fiorentina cover the entire culinary geography of Italy, deliciously. Gorgeously illustrated, this sensuous cookbook offers more than a glimpse into the Italian lifestyle, it brings Italy right into your kitchen. David Rocco, a Food Network Canada star, is the co-creator and host of David Roccos Dolee Vita. Broadcast in over 150 countries,, the show brings a taste of the Italian sweet life into our homes. This has such beautiful illustrations it’s hard to believe it’s a cookbook. I’d almost put it out as a coffee table book. 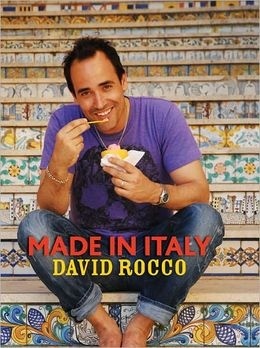 The pictures are of David’s travels throughout Italy as he shares delicious dishes from different regions. He includes little stories and explanations of Italian culinary traditions. The recipes cover all courses. From before meal cocktails to after meal Espresso. This book is all about Italian cooking. He even says that he is not classically trained but Italian trained. According to David the Italian attitude towards food is “Make food you love and make it your own.” This is most definitely the theme of this cookbook. If you are a cook who follows recipes to the letter, you will have difficulty with these recipes. However if you never measure anything and change up your ingredients to your taste, this is the perfect cookbook for you. Almost all of his recipes have QB for quantity. He explains this in the book. It stands for “Quanto Basta’”. Basically it means use as much as you like. So you’ll find no quantities for olive oil or seasonings or cheeses. You should also be a cheese lover for this book. After all, Italian cooking is full of cheese. My husband and son don’t like cheese very much. I’m open to trying it and have found that I like many cheeses. So I made two dishes that had no cheese to start with. The first one I made was the easiest in the book, and I mean easy. I had never tried Fennel and thought I’d like to. The dish is called “Finocchio In Padella” or Fried Fennel. It was quite nice. Even my ‘doesn’t like to try new things’ husband said it was good. My next dish was also quite simple. “Salsicce Al Forno Con Peperoni, Patate E Cipolle” also known as Roasted Sausages, Peppers, Potatoes and Onions. It was very good. My son wanted more. Now if you are watching your weight, this may not be the book for you. David even says that there is no point in trying to make the dishes ‘Healthy’ as it will just spoil the taste. But who says a dieter can’t have the occasional treat! My only complaint is that he uses lots of Italian words. He defines things some of the time but not always. Therefore I didn’t understand a few things. Otherwise I have to say it’s a beautiful, informative and delicious cookbook.